Michelle Barlow has been selected for an England trial. 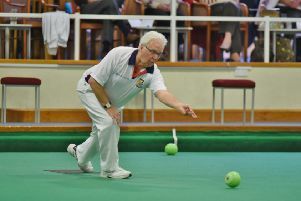 The month-long Bowls England national championships may have just concluded at Leamington, but Parkway ladies return to the Midlands venue this weekend for the Top Club finals. After winning a straight final with Conservative to qualify from Hunts, Parkway have beaten Ampthill (Beds) and Acle St Edmund (Norfolk) to reach the quarter-finals on Saturday where they will face the champions for the past two years, Egham (Surrey). Playing in the final stages is not a new experience for several of the Parkway squad, as some were part of the Peterborough & District team that won the event twice – 1997 and 1999 – and were beaten finalists in 2004 and 2005. One of the Parkway players, Michelle Barlow, has been selected for an England senior trial at Leamington on Saturday, September 24. HUNTS pair Lewis Baker and Ed Elmore were in the England junior team that regained the British Isles Under 25 international series title in Scotland over the weekend. Both the Warboys players were on two winning rinks out of three as England defeated Scotland and Ireland and drew with defending champions Wales. Baker has been included in the senior men’s trial at Leamington on Saturday, September 24, while club-mate Chloe Brett will be attending the under 18 academy at the same venue the following day. DESPITE the pouring rain local bowlers turned out for the annual Peter Bavister Memorial Charity tournament at Whittlesey Manor and raised more than £700 for Magpas, taking the tally raised in three years to more than £2,100 for the emergency medical charity. Fourteen triples took part in the event, the group winners being Sarah Newson, Peter Black and Jeff Newson and Jack Corney, Roger Stevens and Dave Corney. Instead of playing the final the players simply shook hands and donated the prize fund to the charity. BUCKDEN won the Shotbowl sponsored Junior Bowls Triple League for the first time when the finals were held at Needingworth. Four teams of under 18s from Buckden, Needingworth, Sawtry and Papworth were involved, and it is hoped the league will be expanded next year. THE funeral service for Werrington club stalwart Harry White is being held at the Crematorium tomorrow (September 16) at 11am. He collapsed during a Peterborough League match last month and was airlifted to hospital from the bowls green, but unfortunately never recovered. His widow, Shirley, has been totally overwhelmed by messages and sympathy from many clubs in the area and would like to express her thanks for the comfort it has given her. WEST Ward Tigers won two of the three Premier Division titles in the Peterborough League this season, winning the Club 60 and the Weekend League with Blackstones runners-up in both. Parkway A were crowned Midweek Premier League champions and they will be joined in the top flight next season by their C team who have completed four promotions in a row – they finished second to Crowland Jackdaws in Division One. Blackstones ran away with the Division Four title at the first time of asking and will be expected to follow the lead of Parkway C by quickly reaching the top flight. Both Yaxley teams will be in the Club 60 Premier Division next season after finishing first and second in Division One. Spitfires won the league, while the Hurricanes clinched second spot on shots difference with a last match 10-0 defeat of Whittlesey Manor who only wanted a point to make an immediate return to the Premier. Ryhall Robins took the Division Four title honours at the first attempt. Premier Division: Parkway A 162-18; Whittlesey Manor A 117-18; West Ward Tigers 106-18; Peterborough & District 99-18; Yaxley Kites 83-18; CoP Molins A 78-18; CoP Belvedere 74-18; Langtoft Pearl 71-18; Whittlesey Manor B 62-18; Deeping A 43-18. Division One: Crowland Jackdaws 98-16; Parkway C 97-16; Yaxley Falcons 94-16; Conservative A 89-16; West Ward Lions 78-16; Baker Perkins 72-16; Wittering 66-16; Whittlesey Town 61-16; Market Deeping Regal 60-16. Division Two: Longthorpe Romans 97-14; East Community A 93-14; Conservative B 86-14; West Ward Foxes 80-14; Langtoft Pearl B 64-14; West Ward Rhinos 62-14; CoP Molins B 53-14; Itter Park 20-14. Division Three: West Ward Panthers 118-16; Park Crescent Bowlers 105-16; Conservative C 104-16; Parkway B 94-16; Thomas Cook 61-16 (-18); Werrington 61-15 (-56); Deeping B 61-15 (-138); East Community B 53-16; Whittlesey Manor C 48-16. Division Four: Blackstones 132-14; Longthorpe Saxons 76-14; Market Deeping Royal 71-14; Crowland Magpies 69-14; Yaxley Eagles 58-14; City of Peterborough D 50-14 (-171); Burton Street Tigers 50-14 (-193); Crowland Ravens 49-14. Premier Division: West Ward Tigers 112-16; Blackstones 111-16; Peterborough & District 95-16; Deeping A 94-16; Ketton Welland 77-16 (+10); West Ward Lions 77-16 (-15); Longthorpe Tower 75-16; CoP Belvedere 51-16; Itter Park 28-16. Division One: Yaxley Spitfires 106-15; Yaxley Hurricanes 86-16 (+3); Whittlesey Manor 86-16 (-10); Langtoft Pearl Blue 82-16; Whittlesey Town B 80-16; Ketton Chater 75-16; Conservative Blue 71-16; CoP Molins 62-16; Longthorpe Woods 57-15. Division Two: Longthorpe Manor 96-14; West Ward Panthers 92-14; Deeping B 80-14; Barnack 76-14; Baker Perkins 73-14; Crowland A 60-14; Langtoft Pearl Red 48-14; East Community A 35-14. Division Three: Whittlesey Town A 108-16; Conservative Grey 102-16; Parkway 91-16; East Community B 81-15; West Ward Rhinos 80-15; Bourne 78-16; Market Deeping Wade 70-16; Werrington Mill 51-16; Longthorpe Green 49-16. Division Four: Ryhall Robins 111-16; Werrington Fox 108-16; Crowland B 96-16; Bretton 80-16; Burton Street Tigers 78-16; Market Deeping Douglas 76-16; City of Peterborough C 64-16; Thomas Cook 54-16; Deeping C 41-16. Premier Division: West Ward Tigers 107-14; Blackstones 84-14; Whittlesey Town 82-14 (+54); West Ward Lions 82-14 (+10); Conservative 59-14; CoP Belvedere 57-14; West Ward Panthers 55-14; Deeping 29-14. Division One: Yaxley Sharks 113-14; Ketton Hanson 89-14; Peterborough & District 67-14; Stamford 66-14; CoP Molins 62-14; Baker Perkins 57-14; Yaxley Seals 53-14; Park Crescent Bowlers 48-14. Division Two: Langtoft Pearl 130-16; East Community B 98-16; Whittlesey Manor 79-16; East Community A 76-16; Bretton 74-16; Werrington 72-16; West Ward Rhinos 67-16; Whittlesey Town Bears 64-16; Burton Street Tigers 45-16.